Two Catwalk Shows. Live Entertainment Showcase. 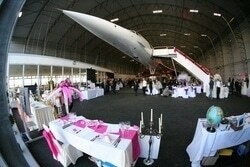 Planning your wedding beneath the iconic Concorde at our Cheshire Wedding Show – can you think of anything more exciting? Combining fresh new creative talent in the wedding industry with the most established names within the region – Sunday 3rd March is a must-have date for your wedding planners! Up to 60 exhibitors, designer catwalk shows, live music showcases and inspirational creative displays.